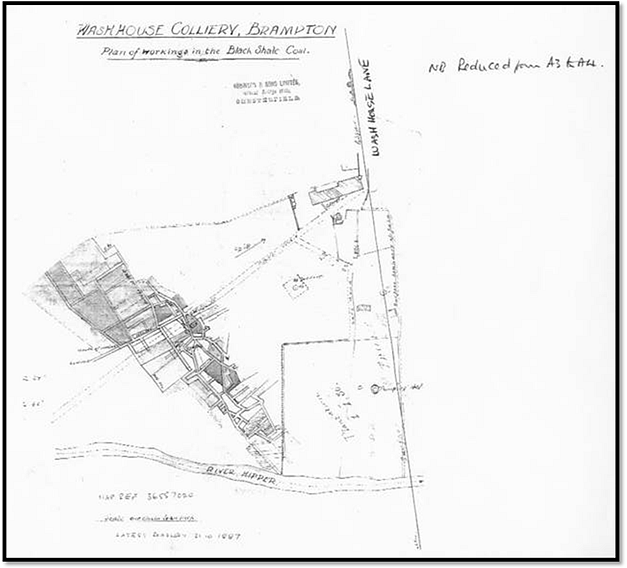 I have found a map of the colliery workings in the Robinson Archives at County Records office when I was researching the history of both Walton Corn Mill and Cannon Mill. An earlier map was dated 1844 and showed less extensive road ways. 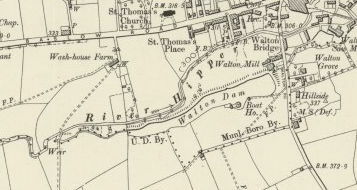 A later map shows a working with a later date of 31st Oct.1887. There is now no evidence on the ground of the workings. However when the Boot’s houses off Oldfield Avenue were being built on the eastern side of the site in about 1996 a hole appeared where a Digger had gone over a roadway. The same thing apparently happened when the swimming pool was being built at Ryeflatt in 1937/38 - a huge hole appeared overnight where they had been digging the day before! I also remember that I was given the impression that the foundations of Ryeflatt were reinforced because of the drift mine nearby. What is certain that the whole of the area where the 22 houses were built was drilled every 10m or so and 2000 tons of Power Station ash mixed with cement pumped into the drilled holes in the ground. Quite frequently coal came up with the spoil from the drill shafts and occasionally water spurted up under pressure! on the SE corner of the workings and also where the word Drain? is written on the map. Water is flowing from the upstream pipe in the bank at the position marked for most of the year and also the pipe positioned just below the weir. The pump Shaft marked on the SE side of the map is something of an enigma, Was it dug to drain the workings? Are the figures 1.1.30 the date it was dug ie.1st Jan.1830? More probably, it was dug to supply water to Walton Dam in periods of drought; In dry summers, Robinson certainly used it for this purpose, over many years. It was last used in 1976 when the level in the well, which was about 60ft deep, fell by 12ft over some days, only to recover in 24hrs when pumping ceased! The treatment Tower for the water from the well was only demolished about 10 years ago. The drain from the pump that goes SE on the map and goes into the river, is contaminated with high levels of ochre(unstable ferrous /ferric oxide) that are visible in the river.